Charles Ferguson Smith was lounging beneath a tree one Saturday afternoon, when Ulysses Grant approached him, explained the events that had occurred two miles further south; and pointing east, directed Smith to 'Take that Fort.' Brigadier General Smith replied, 'I will do it.' And the rest is history. C.F. Smith was regarded as a 'model Army officer,' who looked the way a soldier should look, and acted the way a soldier was expected to act. And yet, he was so much more... his immortal ride in company with the advance upon Fort Donelson was merely one example of the man's capabilities -- displayed over the course of a remarkable career. Graduated from West Point in 1825, with Artillery as his specialty, Smith spent time in garrison duty in Delaware and Georgia, before being recalled to the Military Academy in 1829 for assignment as 'assistant instructor of infantry tactics.' This was superseded a few years later by duty as Adjutant to the Superintendent; and ultimately, C.F. Smith served as Commandant of Cadets. In thirteen years of unbroken service at West Point, Smith had direct influence on the careers of hundreds of graduates of that institution; and he became known to all the USMA Classes, between 1830 and 1846; and Smith acquired personal knowledge of individual members of those classes that would be useful, years later, when fighting against some of them. Churubusco. Part of the Campaign for Contreras, this strategically important location was protected on one side by a large lake; and on the other side, a vast, crumble-crust wasteland of lava bed was believed by the Mexican defenders to be 'impenetrable,' leaving only a long, narrow causeway between the two natural barriers ...which was easily defended. LtCol Smith led his light infantry battalion across the lava bed. And Churubusco fell. After Mexico, C.F. Smith returned to peace-time operations, mostly in the Upper Midwest and West, and engaged in exploration and survey. And by 1860, he was in command of the Department of Utah. When Fort Sumter fell, Smith was called to Washington, to assist with fortifying the Capital. Afterwards, he was sent north on recruiting duty. Promoted to Brigadier General at the end of August, Smith was assigned to the Department of the West, and found himself at Paducah, where he replaced U.S. Grant as commander of that important Kentucky river port. And he assembled the regiments that would become known as the 2nd Division, Army of the Tennessee. Meanwhile, Smith suffered constant pain; and eventually sought relief through a surgical operation on his leg (that became infected), and left him bed-ridden at the end of March. His health progressively deteriorated, until C.F. Smith succumbed on April 25, 1862. His body was returned to the city of his birth, Philadelphia, and buried at Laurel Hill Cemetery. "I divide the duties of a brigadier general into two classes: those owing to his immediate superiors, and those owing to his command. To his superiors, he owes obedience: it being the soul of military organization, I hold obedience as being the beginning and end of duty. It is the rein in hand, by which the superior does his driving; the difference between a captain and a general with respect to duties, is that the general is a captain with multiplied and extended relations. "As the preacher knows his Bible, the general must know the Army regulations and articles of war. Knowledge of those regulations and articles enable the general to perform every duty relative to the care of his command. "It is not possible for a general always to see with his own eyes, to be in two places at the same time: hence the need for Staff --an alter ego -- officers that are men of aptitude and experience, not figure-heads or mere pretty men. "In battle, a general's duties, in order, are: to fight; to fight to best advantage. Genius is determinable by the manner of obedience. A fort is to be taken: genius consists in finding a way to take it with the least appreciable loss. A campaign is to be planned: genius proves itself by devising the best plan; at the same time, strange as it seems, he that is the most capable in planning may be the least capable in execution. The great genius is he who possesses both qualities. reading the 2 accounts of how he acquired his" to be fatal injury the obit leads one that he_ on his march from ft heiman to ft donaldson he was injured..not receiving the injury later.......seems to try to make the injury related to action..do yall read it like this? that's exactly the take i read in the ny times obit...the truth wouldnt read so heroic and who's to question . The charge of the 2ndIowa at FortDonelson brought great fame to the regiment and to Major General Charles Ferguson Smith as evident by the painting Ozzy posted. “Suffice it to say that the assault of the enemy's lines on our right having failed, General Smith was ordered to storm those on our left. Instantly mounting his superb steed, the General, the impersonation of another Mars, rode along the front of his brigades, and, with brow knit in stern resolve, told the men to be ready; then, placing himself before the centre as for review, with McPherson at his side, cool and self-possessed, commanded to charge at double quick with fixed bayonets. Onward his volunteers advanced with the utmost intrepidity through the tempest of iron and leaden hail, opening wide gaps in the serried ranks, soon filled by other brave men. Forward they sped to the thick abatis, which seemed impassable under the deadly fire. Their knightly leader, turning in his saddle and brandishing his sword, cried out in a loud voice: "No flinching now, my lads! Here, — this is the way! Come on, my brave boys!" Threading his path through the felled timber, his noble example inspired his followers, who swarmed in after him as best they could. Then, reforming their ranks, they rushed after their gallant chief into the very jaws of death. Upward, through the smoke of battle, they climbed till the perilous goal was reached; a lodgment was made in the enemy's works, the defenders fled, the day was won, and the battle ended with "unconditional and immediate surrender." The hero of the fight, though such a conspicuous target to the sharpshooters, fortunately escaped with only a contusion below the stomach. Grant generously acknowledged to Smith "that he owed his success at Donelson emphatically to him." Halleck, the Commander of the Department, at once telegraphed to McClellan: "Brig.‑General Charles F. Smith, by his coolness and bravery at FortDonelson when the battle was against us, turned the tide and carried the enemy's outworks; make him a Major-General. You can't get a better one. Honor him for this victory, and the country will applaud." Halleck telegraphed that the 2ndIowa was “the bravest of the brave.” Halleck quickly recommended that brigadier general Smith be promoted to Major General so that Smith would then rank Grant but Grant also was promoted and stayed Smith’s senior. On page 185 of Forts Henry and Donelson – The Key to the Confederate Heartland Benjamin Franklin Cooling wrote: “The stern, yet popular C. F. Smith rode off to start work. His plan was concise: feint with Cook’s smaller brigade while launching the main assault with Lauman’s larger one. Riding over to his favorite 2d Iowa, he shouted; You must take the fort; take your caps off your guns, fix bayonets, no firing until inside the enemy’s works. Regimental formation became ragged once the men reached the bottom of the ravine and crossed the small stream there. Complete confusion attended their ascendance of the opposite slope and entry into the Rebel abatis. They emerged from that obstacle onto slippery slopes, directly within the gunsights of the waiting Confederates. Turning in his saddle, the sixty-year-old Smith bellowed: ‘Damn you, gentlemen, I see skulkers.’ Suggesting that they had enlisted to die for their country, he now offered them that chance. Scared to death, one young volunteer confessed that Smith’s tactic worked. He saw the old man’s mustache over his right shoulder and kept on going. Still another soldier thought it incredible that they could go up the hill and keep any sort of order at all. He felt that a rabbit could scarcely get through the brush and logs. Everyone, however, got through behind the white-haired general on horseback, carrying his sword aloft with hat on the blade tip. Again it was the stuff of heroic painting, and the aghast Confederates held their fire until scarcely twenty yards separated them from the onrushing Yankees. Only three battalions of the 30thTennessee under Major James Turner held these works, and their double-barrel shotguns proved no match for the northerner’s cold steel. ‘Right gallantly was the duty performed,’ beamed Smith later. The impression that it was General Smith who led the charge is also found in Kendall Gott’s, Where the South Lost the War on page 226. 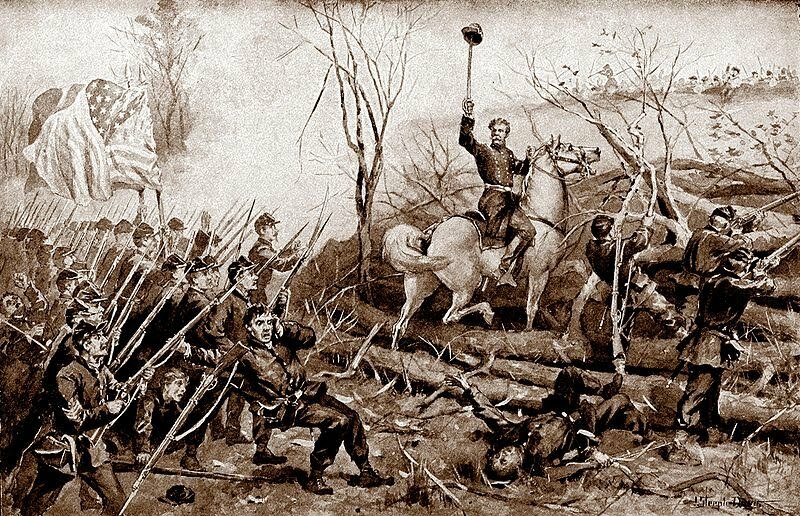 “Smith rode along the front of his division and addressed each regiment. It was not a speech, as such, but it impressed the men greatly. He told them to rely on the bayonet and not to fire a shot until the enemy works were reached and his line broken. Members of the 2ndIowa learned that they were to lead the attack. If they had any lingering doubts of possible defeat in the coming assault, their former brigade commander (Smith) dispelled them. ‘Second Iowa, you must take the fort. Take the caps off your guns, fix bayonets, and I will lead you!’ Each man took up his gun, dressed the lines, and waited for the command to move forward. But, Alas! It did not happen that way. For you see it was Colonel James Madison Tuttle who led those Iowa Hawkeye farm boys up that slope, through the abatis and over the walls of the fort without firing a shot while sustaining upwards of 200 casualties. Tuttle led the left wing, five companies, of the 2ndIowa, in the assault while the right wing trailed behind them from 100 to 150 yards and reached the fort after the left wing had routed the Confederates out of the trenches. Major General Smith came up with the right wing and did not lead the assault. Here is a case of injustice where the commanding officer received the credit for the gallantry and heroic actions of a subordinate. Does that not sound familiar? If General Charles Ferguson Smith received the same treatment as General Benjamin Mayberry Prentiss for receiving credit for something his subordinate had done Smith, too, would be reviled, hated and hounded in his grave. Dr. Cooling quoted Smith as stating “Right gallantly was the duty performed” without specifically noting that Smith was not referring to men he had led but to those led by Colonel Tuttle. Histories written by admirers of regular officers, like surgeon John Brinton, describe the charge as being led by Smith in order to promote the valor of the regular officers. Read Brinton’s account and note how the credit goes to the regular leaders, like Smith and Grant, and how the volunteers are denigrated with the implication that had it not been for the regular officer Major General Charles Ferguson Smith the battle would have been lost. Start at page 120 and you will find descriptions of the charge used by historians over the years. No mention of the valiant Colonel Tuttle and the men of the 2ndIowa but unkind comments about the volunteer soldiers. But when you read Smith’s incomplete account you see that Smith makes no claims to having led the assault and credits Colonel Tuttle. The leading charge was made by five companies of the volunteer regiment, 2ndIowa, led by their volunteer Colonel Tuttle. However, I have yet to find a single account by a historian that depicts that fact. I do not recall exactly when, and how, I discovered that it was actually Tuttle who led the charge up the hill and not Smith. Probably I ran across Twombly’s account. I believe it was the historians who failed to note that the soldier who described seeing Smith’s mustache was in the right wing of the 2ndIowa and they came up behind the left wing of the regiment. An injustice is served upon Colonel Tuttle for not recognizing his part in storming FortDonelson. But the injustice is served by historians and Smith worshippers who wrote erroneous accounts and not Major General Smith himself. I started the post with examples of descriptions of the charge of the 2ndIowa, of which Tuttle was the Colonel, that do not mention Tuttle at all. This includes the two major books describing the battle of FortDonelson. Based on Smith’s previous conduct I believe that had he been alive and known of the injustice done to Colonel Tuttle he would have taken steps to remedy it. There is no discredit meant here to General Smith but only an attempt to provide the truth of what happened. The area where the 2ndIowa came down off the hill to start their advance is now a residential area but the FortDonelson park boundary extends to the bottom of the hill they charged up so it is possible to walk in their footsteps. Inspiring.... chilling... legendary. When one reads fully the story of that charge of February 15th at Fort Donelson, the wonder of it... how inexperienced volunteers could attempt that assault, with uncapped rifles... Great telling of their story; thanks for bringing 'the complete account' to our attention. Charles Ferguson Smith did not submit a report after the Battle of Fort Donelson (the draft report was found among his belongings, after his death.) I begin to understand, now, why he did not furnish that report... and admire him the more for his inaction.